Vitamin B12 deficiency, also known as cobalamin deficiency, is the medical condition of low blood levels of vitamin B12. In mild deficiency a person may feel tired and have a reduced number of red blood cells (anemia). In moderate deficiency there may be inflammation of the tongue and the beginning of neurological problems including abnormal sensations such as pins and needles, while severe deficiency may include reduced heart function and greater neurological problems. Neurological problems may include changes in reflexes, poor muscle function, memory problems, decreased taste, and in extreme cases psychosis. Sometimes temporary infertility may also occur. In young children symptoms include poor growth, poor development, and difficulties with movement. Without early treatment some of the changes may be permanent. Common causes include poor absorption from the stomach or intestines, decreased intake, and increased requirements. Decreased absorption may be due to pernicious anemia, surgical removal of the stomach, chronic inflammation of the pancreas, intestinal parasites, certain medications, and some genetic disorders. Decreased intake may occur in vegetarians or people who are malnourished. Increased requirements occur in people with HIV/AIDS, and in those with rapid red blood cell breakdown. Diagnosis is typically based on blood levels of vitamin B12. Elevated methylmalonic acid levels may also indicate a deficiency. A type of anemia known as megaloblastic anemia is often but not always present. Treatment consists of using vitamin B12 by mouth or by injection; initially in high daily doses, followed by less frequent lower doses as the condition improves. If a reversible cause is found, that cause should be addressed if possible. If no reversible cause is found - or when found it cannot be eliminated - lifelong vitamin B12 supplementation is usually recommended. Vitamin B12 deficiency is preventable with supplements containing the vitamin: this is recommended in pregnant vegetarians and vegans, and not harmful in others. Risk of toxicity due to vitamin B12 is low. Vitamin B12 deficiency in the US and the UK is estimated to occur in about 6 percent of those under the age of 60, and 20 percent of those over the age of 60. In Latin America rates are estimated at 40 percent and they may be as high as 80 per cent in parts of Africa and Asia. Vitamin B12 deficiency can lead to anemia and neurological disorders. A mild deficiency may not cause any discernible symptoms, but as the deficiency becomes more significant, symptoms of anemia may result, such as weakness, fatigue, light-headedness, rapid heartbeat, rapid breathing and pale color to the skin. It may also cause easy bruising or bleeding, including bleeding gums, gastrointestinal side effects including sore tongue, stomach upset, weight loss, and diarrhea or constipation. If the deficiency is not corrected, nerve cell damage can result. If this happens, vitamin B12 deficiency may result in tingling or numbness to the fingers and toes, difficulty walking, mood changes, depression, memory loss, disorientation and, in severe cases, dementia. Gastrointestinal symptoms: alteration in bowel motility, such as mild diarrhea or constipation, and loss of bladder or bowel control. These are thought to be due to defective DNA synthesis inhibiting replication in a site with a high turnover of cells. This may also be due to the autoimmune attack on the parietal cells of the stomach in pernicious anemia. There is an association with GAVE syndrome (commonly called watermelon stomach) and pernicious anemia. Neurological symptoms: Sensory or motor deficiencies (absent reflexes, diminished vibration or soft touch sensation), subacute combined degeneration of spinal cord, seizures, or even symptoms of dementia and or other psychiatric symptoms may be present. Deficiency symptoms in children include developmental delay, regression, irritability, involuntary movements and hypotonia. The presence of peripheral sensory-motor symptoms or subacute combined degeneration of spinal cord strongly suggests the presence of a B12 deficiency instead of folate deficiency. Methylmalonic acid, if not properly handled by B12, remains in the myelin sheath, causing fragility. Dementia and depression have been associated with this deficiency as well, possibly from the under-production of methionine because of the inability to convert homocysteine into this product. Methionine is a necessary cofactor in the production of several neurotransmitters. Vitamin B12 deficiency can cause severe and irreversible damage, especially to the brain and nervous system. These symptoms of neuronal damage may not reverse after correction of hematological abnormalities, and the chance of complete reversal decreases with the length of time the neurological symptoms have been present. Elderly people are at a even higher risk of this type of damage. In infants a number of neurological symptoms can be evident due to maternal malnutrition or pernicious anemia. These include poor growth, apathy, having no desire for food, and developmental regression. While most symptoms resolve with supplementation some developmental and cognitive problems may persist. Tinnitus may be associated with vitamin B12 deficiency. Inadequate dietary intake of vitamin B12. Vitamin B12 occurs in animal products (eggs, meat, milk) and in some edible algae. B12 isolated from bacterial cultures is also added to many fortified foods, and available as a dietary supplement. Vegans, and to a lesser degree vegetarians, may also be at risk for B12 deficiency due to inadequate dietary intake of B12, if they do not supplement. Children are at a higher risk for B12 deficiency due to inadequate dietary intake, as they have fewer vitamin stores and a relatively larger vitamin need per calorie of food intake. Selective impaired absorption of vitamin B12 due to intrinsic factor deficiency. This may be caused by the loss of gastric parietal cells in chronic atrophic gastritis (in which case, the resulting megaloblastic anemia takes the name of "pernicious anemia"), or may result from wide surgical resection of stomach (for any reason), or from rare hereditary causes of impaired synthesis of intrinsic factor. B12 deficiency is more common in the elderly because gastric intrinsic factor, necessary for absorption of the vitamin, is deficient, due to atrophic gastritis. Impaired absorption of vitamin B12 in the setting of a more generalized malabsorption or maldigestion syndrome. This includes any form due to structural damage or wide surgical resection of the terminal ileum (the principal site of vitamin B12 absorption). Forms of achlorhydria (including that artificially induced by drugs such as proton pump inhibitors and histamine 2 receptor antagonists) can cause B12 malabsorption from foods, since acid is needed to split B12 from food proteins and salivary binding proteins. This process is thought to be the most common cause of low B12 in the elderly, who often have some degree of achlorhydria without being formally low in intrinsic factor. This process does not affect absorption of small amounts of B12 in supplements such as multivitamins, since it is not bound to proteins, as is the B12 in foods. Surgical removal of the small bowel (for example in Crohn's disease) such that the patient presents with short bowel syndrome and is unable to absorb vitamin B12. This can be treated with regular injections of vitamin B12. Long-term use of ranitidine hydrochloride may contribute to deficiency of vitamin B12. Untreated celiac disease may also cause impaired absorption of this vitamin, probably due to damage to the small bowel mucosa. In some people, vitamin B12 deficiency may persist despite treatment with a gluten-free diet and require supplementation. Some bariatric surgical procedures, especially those that involve removal of part of the stomach, such as Roux-en-Y gastric bypass surgery. (Procedures such as the adjustable gastric band type do not appear to affect B12 metabolism significantly). Bacterial overgrowth within portions of the small intestine, such as may occur in blind loop syndrome, (a condition due to a loop forming in the intestine) may result in increased consumption of intestinal vitamin B12 by these bacteria. The diabetes medication metformin may interfere with B12 dietary absorption. A genetic disorder, transcobalamin II deficiency can be a cause. Alcoholism - if a "diet" of excessive alcohol intake is substituted for a diet adequate in sources of B12. Nitrous oxide exposure, and recreational use. Chronic exposure to toxigenic molds and mycotoxins found in water damaged buildings. Increased needs by the body due to AIDS, or hemolysis the breakdown of red blood cells. The total amount of vitamin B12 stored in the body is between two and five milligrams in adults. Approximately 50% is stored in the liver, but approximately 0.1% is lost each day, due to secretions into the gut—not all of the vitamin in the gut is reabsorbed. While bile is the main vehicle for B12 excretion, most of this is recycled via enterohepatic circulation. Due to the extreme efficiency of this mechanism, the liver can store three to five years worth of vitamin B12 under normal conditions and functioning. However, the rate at which B12 levels may change when dietary intake is low depends on the balance between several variables. Methionine is activated to S-adenosyl methionine, which aids in purine and thymidine synthesis, myelin production, protein/neurotransmitters/fatty acid/phospholipid production and DNA methylation. 5-Methyl tetrahydrofolate provides a methyl group, which is released to the reaction with homocysteine, resulting in methionine. This reaction requires cobalamin as a cofactor. The creation of 5-methyl tetrahydrofolate is an irreversible reaction. If B12 is absent, the forward reaction of homocysteine to methionine does not occur, homocysteine concentrations increase, and the replenishment of tetrahydrofolate stops. Because B12 and folate are involved in the metabolism of homocysteine, hyperhomocysteinuria is a non-specific marker of deficiency. Methylmalonic acid is used as a more specific test of B12 deficiency. A spongiform state of neural tissue along with edema of fibers and deficiency of tissue. The myelin decays, along with axial fiber. In later phases, fibric sclerosis of nervous tissues occurs. Those changes apply to dorsal parts of the spinal cord and to pyramidal tracts in lateral cords. The pathophysiologic state of the spinal cord is called subacute combined degeneration of spinal cord. In the brain itself, changes are less severe: They occur as small sources of nervous fibers decay and accumulation of astrocytes, usually subcortically located, and also round hemorrhages with a torus of glial cells. Pathological changes can be noticed as well in the posterior roots of the cord and, to lesser extent, in peripheral nerves. Abnormalities might be observed in MRI. 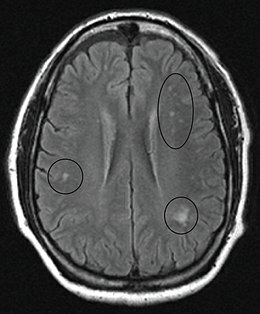 MRI image of the brain in vitamin B12 deficiency, axial view showing the "precontrast FLAIR image": note the abnormal lesions (circled) in the periventricular area suggesting white matter pathology. MRI image of the cervical spinal cord in vitamin B12 deficiency showing subacute combined degeneration. (A) The midsagittal T2 weighted image shows linear hyperintensity in the posterior portion of the cervical tract of the spinal cord (black arrows). (B) Axial T2 weighted images reveal the selective involvement of the posterior columns. Diagnosis is typically based on vitamin B12 blood levels below 120–180 picomol/L (170–250 pg/mL) in adults. Elevated methylmalonic acid levels (values >0.4 micromol/L) may also indicate a deficiency. Serum homocysteine and methylmalonic acid levels are considered more reliable indicators of B12 deficiency than the concentration of B12 in blood. The levels of these substances are high in B12 deficiency and can be helpful if the diagnosis is unclear. Routine monitoring of methylmalonic acid levels in urine is an option for people who may not be getting enough dietary B12, as a rise in methylmalonic acid levels may be an early indication of deficiency. If nervous system damage is suspected, B12 analysis in cerebrospinal fluid is possible, though such an invasive test should be considered only if blood testing is inconclusive. The Schilling test was a radio-isotope method, now outdated, of testing for low vitamin B12. The National Institutes of Health (NIH) has found that "Large amounts of folic acid can mask the damaging effects of vitamin B12 deficiency by correcting the megaloblastic anemia caused by vitamin B12 deficiency without correcting the neurological damage that also occurs", there are also indications that "high serum folate levels might not only mask vitamin B12 deficiency, but could also exacerbate the anemia and worsen the cognitive symptoms associated with vitamin B12 deficiency". Due to the fact that in the United States legislation has required enriched flour to contain folic acid to reduce cases of fetal neural-tube defects, consumers may be ingesting more than they realize. To counter the masking effect of B12 deficiency the NIH recommends "folic acid intake from fortified food and supplements should not exceed 1,000 μg daily in healthy adults." Most importantly, B12 deficiency needs to be treated with B12 repletion. Limiting folic acid will not counter the irrevocable neurological damage that is caused by untreated B12 deficiency. 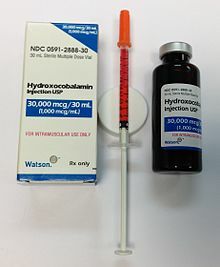 Hydroxocobalamin injection is a clear red liquid solution. B12 can be supplemented by pill or injection and appears to be equally effective in those with low levels due to absorption problems. When large doses are given by mouth its absorption does not rely on the presence of intrinsic factor or an intact ileum. Generally 1 to 2 mg daily is required as a large dose. Even pernicious anemia can be treated entirely by the oral route. These supplements carry such large doses of the vitamin that 1% to 5% of high oral doses of free crystalline B12 is absorbed along the entire intestine by passive diffusion. Vitamin B12 deficiency is quite common and widespread. In the US and UK, as around 6 percent of people have the deficiency, and this rises to around 20 percent in those over the age of sixty. In less developed countries the rates are higher. For example across Latin America 40 percent, in some parts of Africa 70 percent, and in some parts of India 70 and 80 percent. 1849 - Thomas Addison first described a case of pernicious anemia. 1877 - William Osler and William Gardner first described a case of neuropathy in this condition. 1880 - Paul Ehrlich first identified megaloblasts in the bone marrow in this condition. 1887 - Ludwig Lichtheim first described a case of myopathy in this condition. 1926 - George Minot shared the 1934 Nobel Prize with William Murphy and George Whipple, for discovery of an effective treatment for pernicious anemia using liver concentrate, later found to contain a large amount of vitamin B12. 1929 - William Castle demonstrated that gastric juice contained an "intrinsic factor" which when combined with meat ingestion resulted in absorption of the vitamin in this condition. Ruminants, such as cows and sheep, absorb B12 synthesized by their gut bacteria. Sufficient amounts of cobalt need to be consumed for this B12 synthesis to occur. In the early 20th century during the development for farming of the North Island Volcanic Plateau of New Zealand, cattle suffered from what was termed "bush sickness". It was discovered that the volcanic soils lacked the cobalt salts essential for synthesis of the vitamin by their gut bacteria. The "coast disease" of sheep in the coastal sand dunes of South Australia in the 1930s was found to originate in nutritional deficiencies of the trace elements, cobalt and copper. The cobalt deficiency was overcome by the development of "cobalt bullets", dense pellets of cobalt oxide mixed with clay given orally for lodging in the animal's rumen. ^ a b c d e f g h i j k l m n o Hunt, A; Harrington, D; Robinson, S (4 September 2014). "Vitamin B12 deficiency" (PDF). BMJ. 349: g5226. doi:10.1136/bmj.g5226. PMID 25189324. Archived (PDF) from the original on 12 March 2017. ^ a b c d e f g h i j k l m "Dietary Supplement Fact Sheet: Vitamin B12 — Health Professional Fact Sheet". National Institutes of Health: Office of Dietary Supplements. 2016-02-11. Archived from the original on 2016-07-27. Retrieved 2016-07-15. ^ a b c Wang, H; Li, L; Qin, LL; Song, Y; Vidal-Alaball, V; Liu, TH (March 2018). "Oral vitamin B12 versus intramuscular vitamin B12 for vitamin B12 deficiency". Cochrane Database of Systematic Reviews. 3: CD004655. doi:10.1002/14651858.CD004655.pub3. PMC 5112015. PMID 29543316. ^ Herrmann, Wolfgang (2011). Vitamins in the prevention of human diseases. Berlin: Walter de Gruyter. p. 245. ISBN 9783110214482. ^ Lachner, C; Steinle, NI; Regenold, WT (2012). "The neuropsychiatry of vitamin B12 deficiency in elderly patients". The Journal of Neuropsychiatry and Clinical Neurosciences. 24 (1): 5–15. doi:10.1176/appi.neuropsych.11020052. PMID 22450609. ^ Pawlak, R; Parrott, SJ; Raj, S; Cullum-Dugan, D; Lucus, D (February 2013). "How prevalent is vitamin B(12) deficiency among vegetarians?". Nutrition Reviews. 71 (2): 110–7. doi:10.1111/nure.12001. PMID 23356638. ^ Hankey, Graeme J.; Wardlaw, Joanna M. (2008). Clinical neurology. London: Manson. p. 466. ISBN 9781840765182. ^ Schwartz, William (2012). The 5-minute pediatric consult (6th ed.). Philadelphia: Wolters Kluwer Health/Lippincott Williams & Wilkins. p. 535. ISBN 9781451116564. ^ Reynolds, E.H. (2014). "The neurology of folic acid deficiency". In Biller, José; Ferro, José M. (eds.). Neurologic aspects of systemic disease. Handbook of Clinical Neurology. 120. pp. 927–43. doi:10.1016/B978-0-7020-4087-0.00061-9. ISBN 9780702040870. PMID 24365361. ^ Briani C, Dalla Torre C, Citton V, Manara R, Pompanin S, Binotto G, Adami F (2013). "Cobalamin Deficiency: Clinical Picture and Radiological Findings". Nutrients. 5 (11): 4521–4539. doi:10.3390/nu5114521. ISSN 2072-6643. PMC 3847746. PMID 24248213. ^ DN Amarapurka MD, ND Patel MD (September 2004). "Gastric Antral Vascular Ectasia (GAVE) Syndrome" (PDF). Journal of the Association of Physicians of India. 52: 757. Archived (PDF) from the original on 2016-03-04. ^ Matsumoto A, Shiga Y, Shimizu H, Kimura I, Hisanaga K (Apr 2009). "[Encephalomyelopathy due to vitamin B12 deficiency with seizures as a predominant symptom]". Rinsho Shinkeigaku. 49 (4): 179–85. doi:10.5692/clinicalneurol.49.179. PMID 19462816. ^ Kumar S (Mar 2004). "Recurrent seizures: an unusual manifestation of vitamin B12 deficiency". Neurology India. 52 (1): 122–123. PMID 15069260. Archived from the original on 2011-01-23. ^ Mustafa TAŞKESEN; Ahmet YARAMIŞ; Selahattin KATAR; Ayfer GÖZÜ PİRİNÇÇİOĞLU; Murat SÖKER. "Neurological presentations of nutritional vitamin B12 deficiency in 42 breastfed infants in Southeast Turkey" (PDF). Turkish Journal of Medical Sciences. 41 (6): 1091–1096. Archived (PDF) from the original on 2013-12-14. Retrieved 2013-12-29. ^ Yavuz H (Sep 2008). "Vitamin B12 deficiency and seizures". Developmental Medicine & Child Neurology (Open access). 50 (9): 720. doi:10.1111/j.1469-8749.2008.03083.x. PMID 18754925. ^ Kumar S, Narasimha A, Holla B, Viswanath B, Narayanaswamy JC, Math SB, Chandrashekar CR (2013). "Reversible dementia in young persons due to cobalamin deficiency". The Journal of Neuropsychiatry and Clinical Neurosciences. 25 (1): E62–E63. doi:10.1176/appi.neuropsych.12040083. PMID 23487240. ^ Kliegman, Robert M.; Stanton, Bonita M.D. ; Geme, Joseph St.; Schor, Nina F, eds. (2016). Nelson Textbook of Pediatrics (20th ed.). pp. 2319–2326. ISBN 978-1-4557-7566-8. ^ Stabler, S P; Lindenbaum, J; Allen, R H (1997-10-01). "Vitamin B-12 deficiency in the elderly: current dilemmas". The American Journal of Clinical Nutrition. 66 (4): 741–749. doi:10.1093/ajcn/66.4.741. ISSN 0002-9165. PMID 9322547. ^ Dror DK, Allen LH (May 2008). "Effect of vitamin B12 deficiency on neurodevelopment in infants: current knowledge and possible mechanisms". Nutrition Reviews. 66 (5): 250–5. doi:10.1111/j.1753-4887.2008.00031.x. PMID 18454811. ^ Black MM (Jun 2008). "Effects of vitamin B12 and folate deficiency on brain development in children". Food and Nutrition Bulletin. 29 (2 Suppl): S126–31. doi:10.1177/15648265080292S117. PMC 3137939. PMID 18709887. ^ Croft MT, Lawrence AD, Raux-Deery E, Warren MJ, Smith AG (Nov 2005). "Algae acquire vitamin B12 through a symbiotic relationship with bacteria". Nature. 438 (7064): 90–3. doi:10.1038/nature04056. PMID 16267554. ^ Martens JH, Barg H, Warren MJ, Jahn D (Mar 2002). "Microbial production of vitamin B12". Applied Microbiology and Biotechnology. 58 (3): 275–85. doi:10.1007/s00253-001-0902-7. PMID 11935176. ^ Baik HW, Russell RM (1999). "Vitamin B12 deficiency in the elderly". Annual Review of Nutrition. 19: 357–77. doi:10.1146/annurev.nutr.19.1.357. PMID 10448529. ^ Lam JR, Schneider JL, Zhao W, Corley DA (Dec 2013). "Proton pump inhibitor and histamine 2 receptor antagonist use and vitamin B12 deficiency". JAMA: The Journal of the American Medical Association. 310 (22): 2435–2442. doi:10.1001/jama.2013.280490. PMID 24327038. ^ Baik, H.W. ; Russell, R.M. (1999). "Vitamin B12 deficiency in the elderly". Annual Review of Nutrition. 19: 357–377. doi:10.1146/annurev.nutr.19.1.357. PMID 10448529. ^ Yeomans ND, Hanson RG, Smallwood RA, Mihaly GW, Louis WJ (1982). "Effect of chronic ranitidine treatment on secretion of intrinsic factor". British Medical Journal (Clinical Research Ed.). 285 (6337): 264. doi:10.1136/bmj.285.6337.264. PMC 1499627. PMID 6124297. ^ Caruso R, Pallone F, Stasi E, Romeo S, Monteleone G (2013). "Appropriate nutrient supplementation in celiac disease". Annals of Medicine (Review). 45 (8): 522–31. doi:10.3109/07853890.2013.849383. PMID 24195595. ^ "Blind loop syndrome - Diagnosis and treatment - Mayo Clinic". www.mayoclinic.org. Archived from the original on 2018-05-09. ^ Ting RZ, Szeto CC, Chan MH, Ma KK, Chow KM (Oct 2006). "Risk factors of vitamin B(12) deficiency in patients receiving metformin". Archives of Internal Medicine. 166 (18): 1975–9. doi:10.1001/archinte.166.18.1975. PMID 17030830. ^ a b Nagao, T; Hirokawa, M (October 2017). "Diagnosis and treatment of macrocytic anemias in adults". Journal of General and Family Medicine. 18 (5): 200–204. doi:10.1002/jgf2.31. PMC 5689413. PMID 29264027. ^ Kondo H, Osborne ML, Kolhouse JF, Binder MJ, Podell ER, Utley CS, Abrams RS, Allen RH (May 1981). "Nitrous oxide has multiple deleterious effects on cobalamin metabolism and causes decreases in activities of both mammalian cobalamin-dependent enzymes in rats". Journal of Clinical Investigation. 67 (5): 1270–1283. doi:10.1172/JCI110155. PMC 370693. PMID 6112240. ^ Anyanwu, EC; Morad, M; Campbell, AW (26 August 2004). "Metabolism of mycotoxins, intracellular functions of vitamin B12, and neurological manifestations in patients with chronic toxigenic mold exposures. A review". TheScientificWorldJournal. 4: 736–45. doi:10.1100/tsw.2004.133. PMC 5956359. PMID 15349513. ^ Anyanwu, EC; Kanu, I (12 October 2007). "Biochemical impedance on intracellular functions of vitamin B12 in chronic toxigenic mold exposures". The Scientific World Journal. 7: 1649–57. doi:10.1100/tsw.2007.113. ISSN 1537-744X. PMC 5900526. PMID 17982599. ^ Voet, Donald, Voet, Judith G. (2010). Biochemistry. New York: J. Wiley & Sons. p. 957. ISBN 978-0470-57095-1. ^ Yamada K (2013). "Chapter 9. Cobalt: Its Role in Health and Disease". In Astrid Sigel, Helmut Sigel and Roland K. O. Sigel (ed.). Interrelations between Essential Metal Ions and Human Diseases. Metal Ions in Life Sciences. 13. Springer. pp. 295–320. doi:10.1007/978-94-007-7500-8_9. ISBN 978-94-007-7499-5. PMID 24470095. ^ Shane B, Stokstad EL (1985). "Vitamin B12-folate interrelationships". Annual Review of Nutrition. 5: 115–41. doi:10.1146/annurev.nu.05.070185.000555. PMID 3927946. ^ "Vitamin B12 / Pathophysiology Text". LifeSave.org. p. 215. Archived from the original on 2013-02-06. Retrieved 2013-12-31. ^ Guez S, Chiarelli G, Menni F, Salera S, Principi N, Esposito S (2012). "Severe vitamin B12 deficiency in an exclusively breastfed 5-month-old Italian infant born to a mother receiving multivitamin supplementation during pregnancy". BMC Pediatrics (Full text). 12: 85. doi:10.1186/1471-2431-12-85. PMC 3407531. PMID 22726312. ^ "Test used to diagnose B12 deficiency may be inadequate". news-medical.net. October 28, 2004. Archived from the original on September 29, 2007. Retrieved 2007-12-04. ^ Donaldson MS (2000). "Metabolic vitamin B12 status on a mostly raw vegan diet with follow-up using tablets, nutritional yeast, or probiotic supplements". Annals of Nutrition & Metabolism. 44 (5–6): 229–34. doi:10.1159/000046689. PMID 11146329. Archived from the original on 2011-06-15. ^ Devalia V (Aug 2006). "Diagnosing vitamin B-12 deficiency on the basis of serum B-12 assay". BMJ. 333 (7564): 385–6. doi:10.1136/bmj.333.7564.385. PMC 1550477. PMID 16916826. ^ Nickoloff E (1988). "Schilling test: physiologic basis for and use as a diagnostic test". Crit Rev Clin Lab Sci. 26 (4): 263–276. doi:10.3109/10408368809105892. PMID 3077032. ^ Melinda Beck (January 18, 2011). "Sluggish? Confused? Vitamin B12 May Be Low". Wall Street Journal. Archived from the original on September 8, 2017. ^ Kuzminski AM, Del Giacco EJ, Allen RH, Stabler SP, Lindenbaum J (Aug 1998). "Effective treatment of cobalamin deficiency with oral cobalamin". Blood. 92 (4): 1191–1198. PMID 9694707. Archived from the original on 2009-01-07. ^ Bolaman Z, Kadikoylu G, Yukselen V, Yavasoglu I, Barutca S, Senturk T (2003). "Oral versus intramuscular cobalamin treatment in megaloblastic anemia: a single-center, prospective, randomized, open-label study". Clinical Therapeutics. 25 (12): 3124–34. doi:10.1016/S0149-2918(03)90096-8. PMID 14749150. ^ Lane LA, Rojas-Fernandez C; Rojas-Fernandez (2002). "Treatment of vitamin b(12)-deficiency anemia: oral versus parenteral therapy". Annals of Pharmacotherapy. 36 (7–8): 1268–72. doi:10.1345/aph.1A122. PMID 12086562. ^ Butler, C. C.; Vidal-Alaball, J; Cannings-John, R; McCaddon, A; Hood, K; Papaioannou, A; McDowell, I; Goringe, A (2006). "Oral vitamin B12 versus intramuscular vitamin B12 for vitamin B12 deficiency: A systematic review of randomized controlled trials". Family Practice. 23 (3): 279–285. doi:10.1093/fampra/cml008. PMID 16585128. ^ Wailoo, Keith (1999). "The Corporate "Conquest" of Pernicious Anemia". Drawing blood technology and disease identity in twentieth-century America (Johns Hopkins Paperbacks ed.). Baltimore, Md. : Johns Hopkins University Press. p. Chapter 4. ISBN 9780801870293. Archived from the original on 2016-03-14. ^ Gille, D; Schmid, A (February 2015). "Vitamin B12 in meat and dairy products". Nutrition Reviews. 73 (2): 106–15. doi:10.1093/nutrit/nuu011. PMID 26024497. ^ a b c McDowell, Lee Russell (2008). Vitamins in Animal and Human Nutrition (2nd ed.). Hoboken: John Wiley & Sons. p. 525. ISBN 9780470376683. Archived from the original on 2017-09-08. ^ "Soils". Waikato University. Archived from the original on 2012-01-25. Retrieved 2012-01-16. ^ Australian Academy of Science > Deceased Fellows > Hedley Ralph Marston 1900–1965 Archived 2006-12-06 at the Wayback Machine Accessed 12 May 2013. Greer JP (2014). Wintrobe's Clinical Hematology Thirteenth Edition. Philadelphia, PA: Wolters Kluwer/Lippincott Williams & Wilkins. ISBN 978-1-4511-7268-3. Chapter 36: Megaloblastic anemias: disorders of impaired DNA synthesis by Ralph Carmel. The gold standard of clinical hematology textbooks since 1942. Hunt, A.; Harrington, D.; Robinson, S. (4 September 2014). "Vitamin B12 deficiency". BMJ. 349 (sep04 1): g5226. doi:10.1136/bmj.g5226. PMID 25189324. Pacholok SM, Stuart JJ (2011). Could It Be B12? : An Epidemic of Misdiagnoses. Fresno, CA: Linden Publishing. ISBN 978-1-61035-065-5. Hooper M (2012). Pernicious Anaemia: The Forgotten Disease - the causes and consequences of Vitamin B12 Deficiency. London: Hammersmith Press. ISBN 978-1-78161-004-6.